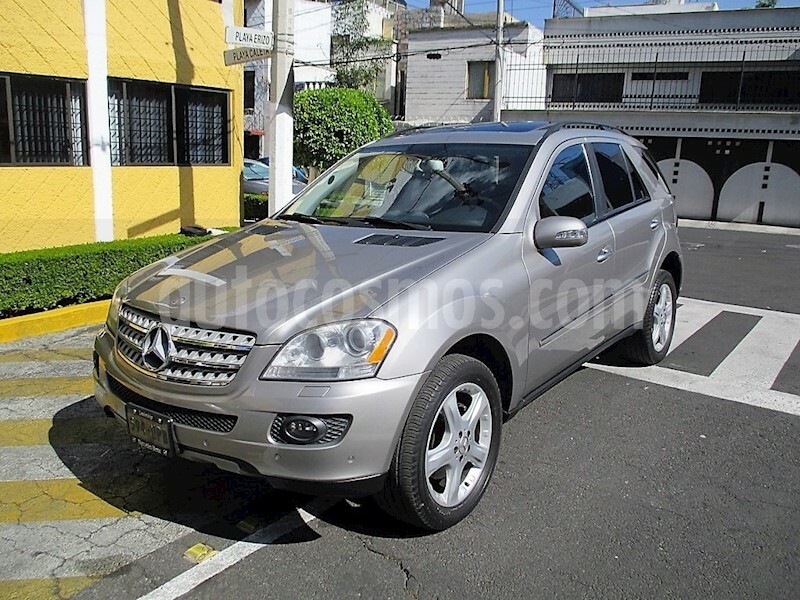 MERCEDES BENZ ML350 “LÍNEA NUEVA” 2007; EN IMPECABLE ESTADO GENERAL VERDADERAMENTE CUIDADA Y SIN DETALLES, CON TAN SOLO 90,000KM Y FACTURA ORIGINAL DE MERCEDES BENZ “NACIONAL” DE AGENCIA ÚNICO DUEÑO, CON TODO PAGADO Y AL CORRIENTE HASTA 2018 SIN MULTAS NI DEUDAS; JAMÁS HA SIDO GOLPEADA Y LA CARROCERIA NO TIENE RAYONES NI DETALLES, EL INTERIOR SE ENCUENTRA PERFECTAMENTE CONSERVADO Y SIN DETALLES, LOS TAPETES, CIELO, BOTONES, MANDOS, INCLUSO VESTIDURAS EN PIEL CON ALCANTARA SE ENCUENTRAN EN EXCELENTE ESTADO DE CONSERVACIÓN, CON TODO FUNCIONANDO COMO CUANDO SALIÓ DE AGENCIA; ES AUTOMÁTICA CON LA PALANCA DE CAMBIOS AL VOLANTE Y CAMBIOS DE PALETA, TOTALMENTE ELÉCTRICA CON DUPLICADO EN LLAVES, RINES DE ALUMINIO, BOLSAS DE AIRE, ESTEREO CD, MP3 CON ENTRADAS AUXILIARES, RADIO SATELITAL CON NAVEGADOR Y ESTEREO CON PANTALLA MULTIFUNCIONES BLUETOOTH, ASIENTOS EN PIEL CON ALCANTARA, COMPUTADORA DE VIAJE, PILOTO AUTOMÁTICO, LLANTAS MAS DE MEDIA VIDA, ETC; MECANICAMENTE HA TENIDO SERVICIOS HECHOS A TIEMPO Y EL KILOMETRAJE ES REAL LO CUAL GARANTIZA SU EXCELENTE FUNCIONAMIENTO GENERAL Y SIN RUIDOS. NOTA: ESTA CAMIONETA FUE LA PRIMERA YA DE MODELO RECIENTE, TIENE MUY POCOS KILOMETROS Y SON LOS ORIGINALES, ES MUY DIFICIL ENCONTRAR UN AUTO DE ESTE MODELO ASI DE CONSERVADO. LAS IMÁGENES Y VIDEOS ACABAN DE SER TOMADAS POR LO QUE LA CAMIONETA ESTA EN EL ESTADO QUE LA ESTA OBSERVANDO. INTERESADOS FAVOR DE COMUNICARSE PARA HACER CITA CON EL SR. JORGE KARIM RESCALA AUREOLES A LOS TELEFONOS, __________ Y ________ CON WHATSAPP.